Last week, I finished the Cloud Forest series of scarves — and they are beautiful. I’ll be sending them off soon to their new owner in California. 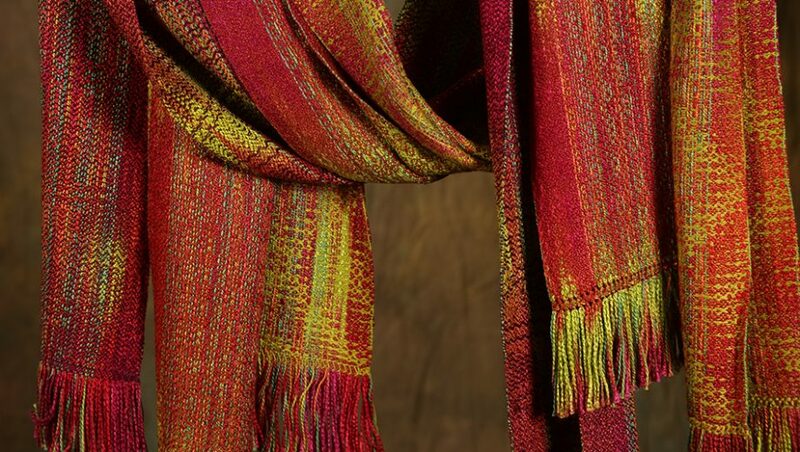 You can see that these yarns are subtle and lustrous; fiber content is silk, rayon, and cotton, emphasis on rayon. The finished piece will be an elegant designer throw for a newly redecorated guest-room; the client sent me samples of the fabrics used for the main furniture pieces in the room and asked that the throw coordinate with them. I worked with my California dyer (I’ve been using her yarns for over thirty years), sending the fabric samples to her and ordering specific quantities of specific yarns. The stunning result of her work is these balls (wound from skeins so I can work with them easily), which when placed beside the fabrics are absolutely perfect. 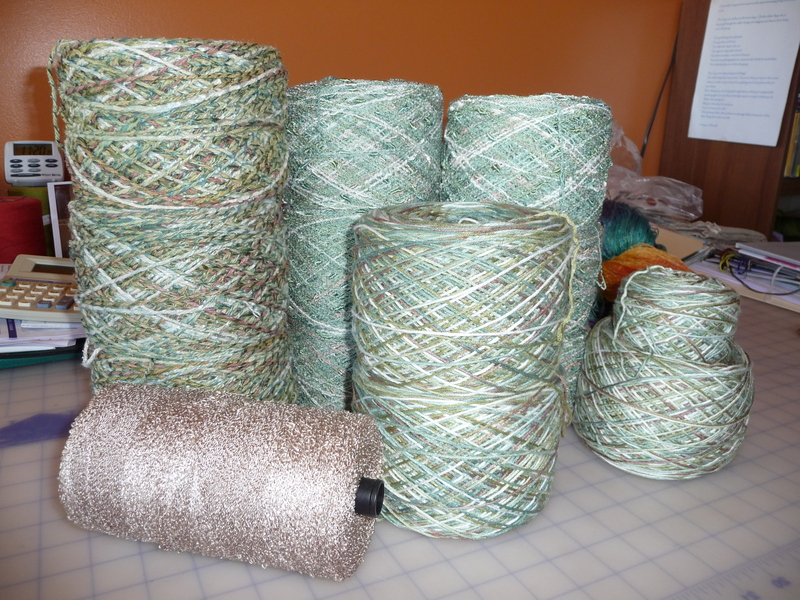 This picture shows the warp (lengthwise) yarns now accompanied by the soft taupe (commercial) rayon boucle which I’ll use for the weft (crosswise yarn). 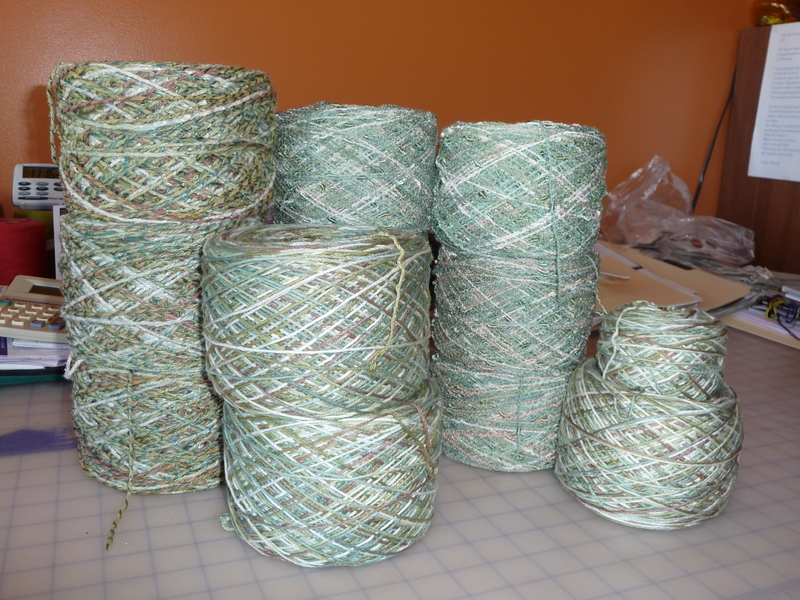 I’ve begun to measure out the warp threads — there will be 896 of them. More about how I came up with that number in my next post. It’s a lot. I have a heap of work to do before I can even begin the actual weaving. It’s a good thing it makes me so happy!